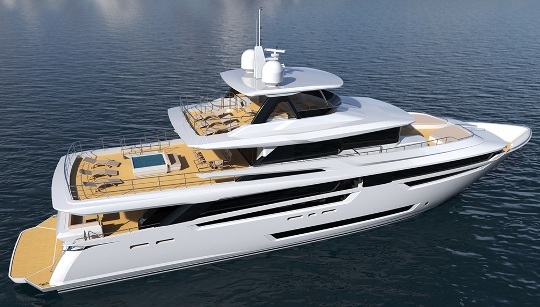 This 115 project will be the new flagship of the Johnson range. This tri-deck yacht takes the distinctive style and values of the Johnson line to a new level of style and sophistication. Her very wide beam hull provides outstanding levels of comfort, performance and interior space. Architectural features like the large full height glass windows of the saloon and the expansive windows in the owner’s suite significantly enhance the experience of living on the water. Dixon Yacht Designs 7.8 meter beam semi-planning ‘Fusion’ hull ensures the 115 provides both optimum efficiency and comfort. It also permits a high level of customization allowing the yacht to be tailored to the individual needs of the customer. Standard layout is for five guest cabins including a forward main deck located full beam layout owners stateroom. The Johnson 115 is to be powered by twin Cats 1925hp engines.